The Scottish salmon industry is booming. It has marketed itself on everyone’s favourite image of Scotland: breath-taking scenery, atmospheric lochs embraced by gentle hills and sleepy glens, where a proud muscular fish leaps out of a rushing burn. The key messages are ‘pristine’, ‘quality’, ‘prime’, ‘healthy’ and ‘provenance’. But for how much longer can the industry maintain this image, in light of increasing controversy around fish health, environmental degradation and doubts about the quality of its product? Over 250 salmon farms operate throughout the west coast of Scotland and on the islands of Orkney and Shetland. 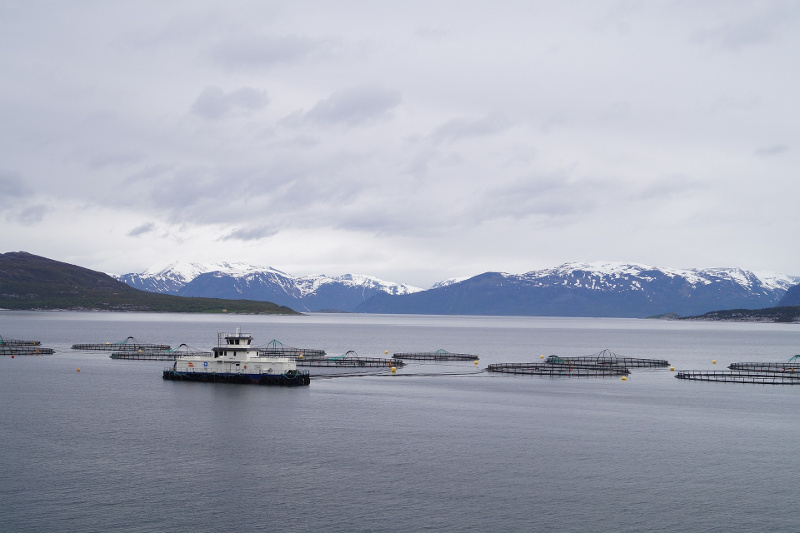 Despite names like the Scottish Salmon Company or Scottish Sea Farms, they are mainly owned by Norwegian multinationals, some of them registered in tax havens. Farms producing 2,500 tonnes, the equivalent of approximately 700,000 fish, sit ominously on the surface of sea lochs and coastal waters, usually in symmetric arrangements of 12 cages, each 120 metres in diameter, like a silent occupation of visiting aliens. The cages are connected by rubber tubing which deliver the feed containing toxic chemicals and antibiotics used to fight sea lice and other diseases. Around 170,000 tonnes of salmon are exported to markets in Europe, the US and China, at a value of around £600 million. And why stop there? The industry intends to double its production by 2030 to between 300 and 400 thousand tonnes per year, a plan which has the seal of approval from the Scottish Government, keen to showcase Scotland as a leading international player in the Food and Drinks sector. However, anyone following the news will know that the industry has lurched from one scandal to another in recent years and was the subject of a damning report by the BBC’s The One Show in December last year, watched by five million viewers. Salmon farms are infested with sea lice which literally eat the fish alive. These weakened fish are susceptible to a host of other diseases, such as Infectious Salmon Anaemia (ISA), Heart and Skeletal Muscle Inflammation (HSMI), and Pancreatic Disease (PD). Antibiotics and chemicals, such as emamectin benzoate, a pesticide used to treat sea lice, are added to the fish feed but have been used in such quantities that some fish have become resistant to them. As a result, the industry loses around 25% of stock annually, a ratio unheard of in any other livestock industry. Residents in the highlands are now familiar with trucks transporting millions of rotting fish for incineration many miles away in northwest England. Each year, thousands of tonnes of fish farm effluent flow into the sea through open net cages. It is estimated that the sewage from fish farms is roughly equivalent to that of the entire population of Scotland. There are 45 sea lochs that have been contaminated by the toxic chemicals emitted from fish farms. Emamectin benzoate, a pesticide toxic to birds, mammals, fish and other aquatic organisms, also has dangerous long-term impacts on crustaceans, with dramatic consequences for creel fisheries, a key economic driver and employer in coastal communities which provide Europe and the world with lobster, prawns and crab. More poignantly perhaps, is the fact that Scotland’s own wild salmon and sea trout stocks are dangerously in decline – and in some rivers even close to extinction – due to parasitisation from the high numbers of sea lice associated with fish farms, past which other fish have to swim. This has prompted an inquiry by the Scottish Government which will take place later this year. So why is the Scottish Government so keen to increase production without first addressing well founded and serious concerns? How can it reconcile its pride in a polluting industry with the many good things in its green agenda on climate change, bans on fracking and plastic straws, and the introduction of bottle return schemes? And how does farmed salmon fit into the Government’s Good Food Nation Bill, designed to promote healthy food and food production? Quite simply, it can’t. But politicians will buckle if pressured on the loss of jobs, and the fish farming industry has used this argument relentlessly and shrewdly, spinning job numbers that give the impression there is no other form of employment in rural areas. A closer look shows that the number of people employed on fish farms in 2016 was approximately 1,800, not the thousands the industry regularly cites by cleverly including the wider supply chain. Compare this to the tourist industry which employs around 200,000 people and in 2015 generated £8.9 billion – revenue which remains in Scotland. Continue reading at Sustainable Food Trust. Lynn Schweisfurth is a member of the Salmon Aquaculture Reform Network Scotland and Scottish Salmon Think-Tank. The REC committee are holding an inquiry into salmon farming in Scotland – written evidence is invited before the deadline of 27th April 2018.